In this episode we discuss lessons from 25 years of studying the evolution of human emotion, examine whether the Machiavellian concept of power still works, explore the surprising scientific data on how you can acquire power, and look closely at the foundation of enduring power from studies of military units on how to achieve and maintain power with Dr. Dacher Keltner. 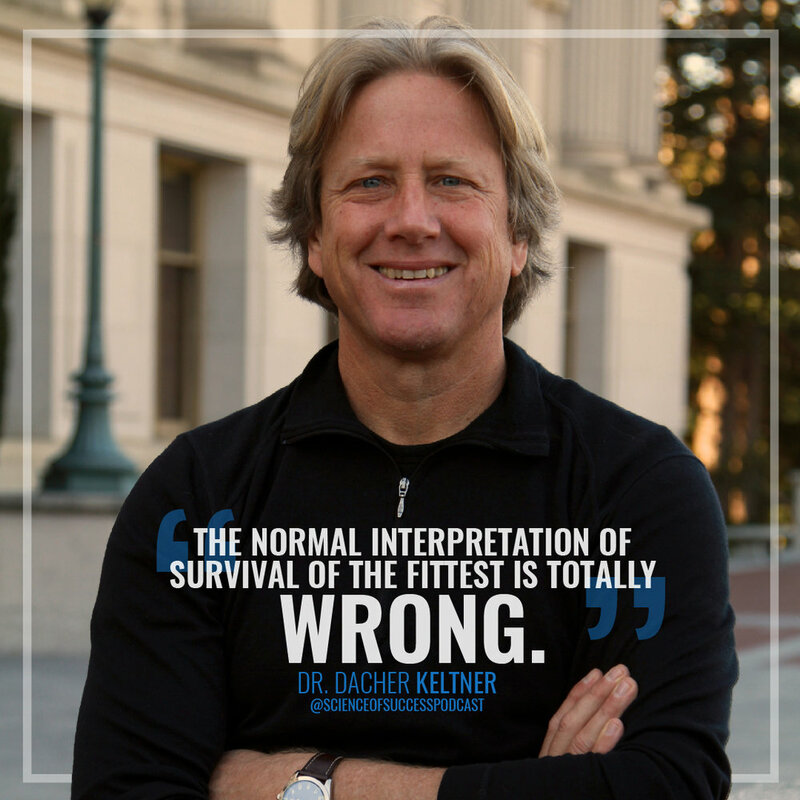 Dr. Dacher Keltner is the founding director of the Greater Good Science Center and a professor of psychology at UC Berkeley. He is also the author of The Power Paradox: How We Gain and Lose Influence and Born to Be Good, and a co-editor of The Compassionate Instinct. Does the Machveiallian conception of power still work? What are the foundations of enduring power? How do we create organizations and societies that prevent the abuses of power? [00:00:12.4] MB: Welcome to the Science of Success. I'm your host, Matt Bodnar. I’m an entrepreneur and investor in Nashville, Tennessee, and I’m obsessed with the mindset of success and the psychology of performance. I’ve read hundreds of books, conducted countless hours of research and study, and I am going to take you on a journey into the human mind and what makes peak performance tick, with the focus on always having our discussion rooted in psychological research and scientific fact, not opinion. In this episode, we discuss lessons from 25 years of studying the evolution of human emotion, examine whether the Machiavellian Concept of Power still works, explore the surprising scientific data on how you can acquire power, and look closely at the foundation of enduring power from studies of military units on how to achieve and maintain power with Dr. Dacher Keltner. The Science of Success continues to grow with more than 625,000 downloads, listeners in over 100 countries, hitting number one New and Noteworthy, and more. A lot of our listeners are curious about how to organize and remember everything. I get tons of listener emails and comments asking me, "How to keep track of all the incredible knowledge I get from reading hundreds of books, interviewing amazing experts, and listening to podcasts and much more?" Because of that, we’ve created an awesome resource for you. You can get it completely free by texting the word “smarter” to the number 44222. It’s a guide we created called How to Organize and Remember Everything. To get it, just text the word “smarter” to the number 44222, or go to scienceofsuccess.co and put in your email. In our previous episode we discussed one of the most interesting results ever found in the psychological research of education, why pleasure maximization is a flawed model for human understanding, we went deep into a number of research examples, discussed the massive and counterintuitive difference between motivating top performers and bottom performers, and much more with Dr. Dan Ariely. If you want to understand the surprising truth that research reveals about what actually motivates you, listen to that episode. [00:02:18] MB: Today, we have another fascinating guest on the show, Dr. Dacher Keltner. Dacher is the founding director of the Greater Good Science Center, a professor of psychology at UC Berkeley. He’s also the author of The Power Paradox: How we gain and lose influence and Born to be Good as well as the co-editor of the Compassion Instinct. Dacher, welcome to the Science of Success. [00:02:40] DK: It’s great to be with you, Matt. [00:02:42] MB: We’re very excited to have you on here. So for our listeners who may not be familiar, tell us a little bit about your background. [00:02:49] DK: Sure, so I grew raised by a mom who is a literature professor and a dad who was an artist in sort of an alternative set of circumstances in the late 60’s and 70’s and then went to undergraduate at UC Santa Barbara, studied sociology and psychology and then Stanford for graduate school in social psychology. And then I think, you know, relevant to my scholarship, for 25 years I have been studying the evolution of human emotion and in particular emotions like compassion and awe and gratitude and laughter. And then relevant to the power paradox, I’ve really been interested in the nature of human hierarchies and how do we get power in different kinds of hierarchies? How do we keep our power? Why does power turns into sociopaths so regularly, as we see in the daily news? So those have been my two long standing interest and then I teach at UC Berkeley. I have a giant lab called the Berkeley Social Interaction Lab and then I run the Greater Good Science Center, among other things. [00:03:48] MB: So to get started, tell us a little bit before we delve into the Power Paradox, which I am very curious about, tell us about the biological and evolutionary origins of human emotion. [00:04:00] DK: I’ve been teaching human emotion at Berkeley for 20 years and there are podcasts that your listeners can listen to from iTunes and the like, and there’s this old idea in the philosophical literature that you see with people like David Hume and Charles Darwin and René Descartes that emotions drive our thought patterns and our reasoning and the way that we act in the world and philosophers like Martha Nussbaum have written about how emotions are core of the social fabric of human society. So the question, Matt, is how do you translate that broad thinking to laboratory science? And my works has really been inspired by Charles Darwin who wrote a really influential book on human emotion in 1872, The Expression of Emotion In Man and Animals where he really argued that, in terms of the biological origins of emotion, emotions are these basic ways in which we see the world, we interact with others and we’ve build up human society. Just to take one example, you take an emotion like gratitude, which my lab has studied in terms of touch and social benefits. When we feel gratitude and we express these emotion to other people it builds up trust and cooperation between non-kin, which in evolutionary framework is a fundamental component to strong, social communities. So we make the case in a lot of different kinds of studies that emotions are biological, they have specific systems in your body that are enabled by emotion. They help us connect to others and they really solve the most important problems of being part of human societies. [00:05:45] MB: And one of the most fascinating things about that concept is the idea that a lot of times people who don’t really have a deep understanding of evolution, sort of hear the phrase "survival of the fittest" and think of the big, strong, violent kind of people winning out but that’s not always the case, right? [00:06:02] DK: Yeah, you know, thanks for asking that Matt. You know we are in the process right now in the evolutionary literature really witnessing I think what you might call a revolution, which is that 40 years ago, when people thought about evolution, when scientist use that framework to think about human behavior, it was really survival of the fittest, right? It was competition, and who’s stronger, and who’s more adversarial to get the advantage that really prevails in terms of gaining resources and reproductive opportunities. And really in the past 40 years, we’ve seen this emergence of really the "survival of the kindest" hypothesis, which is what I’ve called it in Born to be Good. What we’ve seen is, just to give you some illustrative findings like little kids as early as 18 months will help strangers accomplish tasks. That’s the work of Tomasello and Warneken. Around the world, Joseph Hendrich has shown people will share with strangers 40% of their resources when they don’t have to share at all. My lab has shown that we have genes in old parts of the mammalian brain that help us feel compassion and take care of vulnerable individuals. So I think what we’re seeing is survival of the fittest is really an outdated way of thinking about evolution. We’re a very social species, we’re collaborative species, although obviously we do other things, and there are these emotions like compassion and gratitude and awe that help us fold into strong social networks and work well together. [00:07:37] MB: One of the other really fascinating findings or things you talk about around emotion is a lot of times when people think of emotion they view it as sort of this thing we need to get rid of or we need to be these logical, rational robots but you also say that’s not always the correct way to think about it. [00:07:56] DK: Yeah, and this is such an old, I would even call it a bias, in our thinking about emotions, Matt. We think of emotions as destructive and dysfunctional and when we are really mad at our romantic partner or outraged at our family or ashamed of what we’ve done, we’d give anything to get rid of those emotions, right? But in fact, again, we’re starting to see a much different take on the functionality of human emotions in our social living, that emotions really guide thought processes in effective ways. So, my research has shown for example that feelings of compassion help you see how connected you are to other people. Emotions guide social behaviors in really important ways. So there’s a lot of research on gratitude, for example, that if I express gratitude to people who are in my group or the people that I work with, I will actually form stronger social ties within social networks that benefit me downstream. So there are a lot of shifts in how we think about emotions. They aren’t the kind of dysfunctional parts of the human mind, they’re really adaptive. You know, one of the ways that we can test this hypothesis is you can look at people who don’t feel a lot of emotion, who suffer forms of brain damage that harm parts of their frontal lobes that knock out the passions and they really don’t do well in getting along with other people. So I think there’s a movement afoot to rethink what the emotions are. [00:09:32] MB: And that idea combined with sort of a corollary from the point you just made about the survival of the fittest, sort of getting into the concept of the power. When many people think of power they think of this Machiavellian concept. Does that concept still work or is that something that is outdated? [00:09:51] DK: Well, you know, I think it’s so interesting. I think the straightforward Machiavellian approach to power is really, as historians have written. You know, let’s remember Machiavelli wrote The Prince, published in 1532, during a period in Italy which was a very violate time, one of the most violent periods in human history. And the politics were, they'd make us blushed today about how horrifying they were. And the Machiavellian philosophy to power, which your listeners probably would intuitively grasp is, “use force, be feared, be deceptive, trick people. Make them think that you’re good natured when in fact you’re going to screw them over", right? It’s a force and fraud philosophy of power and studies show, if you’re going to negotiate with a really nasty person, you’ve got to have some Machiavellian-ism with you. If you are having a one-shot negotiations, probably be good to be a little bit Machiavellian. But in general, we’re seeing that in studies and organizations and in military units and schools, Machiavellians tend to actually not be respected by people around them, not be trusted by people around them, actually not gain power, not fuel like they’re powerful, in organizations they get paid less. So I think, you know, it’s an interesting historical question about, or observation that we’re really moving away from this force and fraud approach to power, notwithstanding our current politics, and we’re moving more towards collaborative power where we work together and empathize and collaborate to get things done. [00:11:35] MB: So this collaborative power, how would you define sort of the modern day or this new evolution of the concept of power? [00:11:43] DK: You know, it’s really interesting. People have been looking at the nature of work and here I was really influenced by Robert Wright, who was a terrific writer, his book Non-Zero. [00:11:54] MB: I love that book, it’s one of my favorites. [00:11:55] DK: Yeah, it blew my mind, and Wright’s argument is that both in our biological evolution and then in our social evolution as we have become more complex societies from the Renaissance villages that Machiavelli was working in, we’ve become much more collaborative, right? For scientist or innovators to get work done, they’ve got to work with a lot of different kinds of people. When I go consult at Facebook or Google and I work with a team on a project, there are 10 people there. There are designers and engineers, and data analysts, and language specialists, and product managers, they all have these different specializations to get stuff done. For you and I to disseminate some of these ideas, we have multiple talents that we have to work together with to produce a podcast. So life is more collaborative, right? And we are very collaborative species and so what that means is, both early in our evolution in hunter-gatherer societies, it was really the collaborators who really gained respect and power. The individual who knew how to get good fish, or a good food source. or helped unite teams to fend off predators. And then today, what we’re starting to find is this collaborative approach to power where you cooperate, you empower others, you empathize, you build strong teams, actually yields and gains power for the individuals. So I wish, as a historian, they would have written more broadly about how we’re becoming a collaborative world and power policy that I think the data are there. [00:13:34] MB: So getting into the data a little bit, what does the science say? Again because one of the big things on this podcast, we like to be data driven. What does the science say about how to acquire power? [00:13:46] DK: It’s so funny, Matt, I think a lot of people maybe a lot of your listeners like if you ask them, “All right, be honest, do you want to have power?” They'd feel a little bit uneasy or queasy, right? Like, "Oh, I don’t want to grab power," and in a new way that’s because we think of power as Machiavellian. But I really define power as your ability to advance the greater good, to alter states of people around you and make them do good work. And I think that fits a lot of different social scientific definitions of power that you could apply at the international level. So that begs the question of how we gain power, and this is where I was really surprised in writing The Power Paradox about how much we’ve learned to answer this question in the scientific literature. So we gained power, for example, by really listening carefully and really taking in the wisdom and thoughts of other people around you. Abraham Lincoln, in the historical accounts, was just a great practitioner of this art of just empathy, listening, hearing people well, gaining collective wisdom, actually gains you power. Another way we gain power is, to put it really simply, by being kind and pro-social. In hunter-gatherer societies, there’s a prize winning essay that summarizes who are the leaders in 48 hunter-gatherer societies living for 200,000 years in the conditions of our social evolution, that really in which our social structure started to take shape. And Christopher Baum observes, it’s really the person who is fair, impartial, humble, and kind, right? So studies are starting to show, for example, in the competitive altruism literature that if I share, if I’m kind, if I express gratitude, for example in the work of Mike Norton in Harvard in social networks or organizations, people will respect me more. They'll give me status and I’ll have power and influence. So I think in a way, we’re returning slowly, with a lot of exceptions in the world, to our evolutionary roots of power being founded in kindness and empathy and being fair and humble. You seemed shocked. [00:16:08] MB: Oh definitely. I think it’s a very counter intuitive finding. If anything comes to mind, I’d love to maybe hear one or two examples from the research kind of about how you came to that conclusion. [00:16:19] DK: Yeah, so let me give you a couple of examples, and I think these are just scientific tidbits out there, because I’ve been speaking in really broad terms. So what studies find, for example, is that if you are able to read other people’s emotions well and in The Power Paradox, this book, I present a couple of fun tests of like reading emotions from people’s facial expressions or drawings of emotion. If I can empathize in that way, I actually rise in financial analysis firms, right? I gain more power. If I’m a school kid and I’m in seventh grade and I’m facing the Lord of the Flies politics on the playground and I know how to read people’s emotions well, just detecting emotions in their facial expressions, once again I gain social power. If I am working on a team — this is a recent study from MIT by Woolley and colleagues — I am working on a team, we've got to solve some hard problems and I’m listening carefully and asking good questions., really simple practices, my team does better and I gain power, right? So these are all specific examples of how, you know, this counterintuitive notion that being good to others actually gets me power. A final example of Adam Grant and Francesca Gina, if I am the manager and I am trying to get people to do things and I simply say, "Thank you," right? I express gratitude, those people are more productive and enhance my influence and power. So there are a lot of new findings that tell us that Machiavelli was wrong, that the pro-social tendencies are pathways to power. [00:18:01] MB: Is power something that’s given or something that’s taken? [00:18:05] DK: Well, you know, when you look back in history and you read the great historical counts of power, you look at what Hitler did, as a canonical example, and he killed his rival and he killed other rivals and usurped power and then built up his fascist state — by the way, which fell calamitously — and we have this vision or image and this really comes in a way out of Machiavelli that we grab power and you think about House of Cards or Godfather's popular portrayal of this, that’s an old notion. But I think that really in today’s 21st century where we are more interdependent, we are collaborating more, there are better means by which we scrutinize other people’s behavior. I mean nowadays, Matt, almost everything I do is rated in the Internet by Rate Your Professor and people commenting on what I’ve said, and this is true of most people. So what that means is that we’ve moved away from of the power grab view of how we get power to the fact that power is really given to us according to how well we advance other people’s interests. [00:19:22] MB: If power is given what are some of the ways that, you know, where does something enduring power come from? [00:19:30] DK: Yeah, well in a way this is the most important question right?, And there are studies that show that really can pinpoint, and I wrote about this in a piece for the Harvard Business Review, there are just certain things that if you do them you’ll gain respect and power in social groups, right? If you speak out and you offer some interesting ideas, and you ask great questions, you listen well, you show that you’ve got some pro social tendencies that are good for the group, things we've been talking about, you’ll get power. But I think, in a way, the deeper question for us is what you just asked. Which is, "How do I keep my power and status and respect with my work colleagues, or my community colleagues or if I am a part of a politically active group and how do I keep the respect in that group, or with my family?" Right? And what studies are showing is that what really matters in this realm is in a sense that you show that you cannot succumb to sort of indulgent self-interest and that you can stay committed to the group, right? You do things that continue to be good for the group. So studies of military unit show, for example, it’s really the individual who continues to work on behalf of others, show respect to others, express gratitude and sacrifice who really keeps power. Historical studies of US presidents where historians have rated, who are the great presidents with enduring legacy, show it’s really the individuals who had bold ideas like FDR or Abraham Lincoln, but who continue to practice empathy and building strong social ties rather than really serving their own narrow self-interest. So enduring power is really found in these virtues, if you will. These more pro-social tendencies. [00:21:35] MB: And the importance of focusing on empathy and building strong social ties, that really ties into the title of the book, which is The Power Paradox. Tell us a little bit about that concept and why it’s so hard to do that. [00:21:50] DK: Yeah, well this is where the trouble begins. It’s really once we feel powerful. So what we are starting to document in the lab is that if I am a really good practitioner of empathy, and listening, and engaging in other people like Abraham Lincoln was, I’ll gain a lot of power and we talked about that evidence. And, you know, then I was going out in the world and working in different organizational contexts and I would see this come to life. I worked with Pete Docter at Pixar, as a scientific consultant on the film Inside Out, and Pete literally makes movies that have made billions of dollars and I watched his artistic style and how he was with teams and he was almost like Abe Lincoln. You know, he was empathetic and curious with other people and always interested in what other people have to say about an artistic project and in Pixar, people speak of Pete, and he has had enduring power, in really the terms that Christopher Baum wrote about in terms of the leaders of our hunter-gatherer societies. He’s kind, he’s humble, interested in others, he’s really fair, he will go to bat for the things he really believed in, but he had this qualities and then I was doing this research about the abuses of power and what we find is really evidence of this power paradox. We get power by being good to other people, but then the seductions of feeling powerful, it almost feels like a drug rush, or a mania that you just feel omnipotent, it gets you into trouble. So we found, Matt, and you could probably think of a million good examples of this that, you know, “If I get a little bit of power in an experiment and I am working with two other people and I have power, I’ll eat more of the food we’re supposed to share, chocolate chip cookies, and I will eat with my mouth open and lips smacking and cookie crumbs falling all over my sweater,” right? I become impulsive. We did this well-known study that got a big buzz. That when drivers of cars approach a pedestrian zone and we put a young undergraduate at that edge of a pedestrian zone and he looked like he wanted to walk across it, you’re supposed to stop. Drivers of poor cars, the AMC Pacers and so forth always stop. Drivers of powerful fancy cars, Mercedes and BMW’s, blaze through the pedestrian zone 46% of the time. So we started to show, and this has been shown in dozens of labs, a little bit of power, promotion, success, making a lot of money. Suddenly, I am swearing at people, I’m greedy, I am engaging in sexually inappropriate behavior and that’s the power paradox of power is, we get it by being good and then it unleashes what is bad. [00:24:43] MB: And you touched on this a little bit talking about some of the foundations of enduring power, but what are some of the things we can do to prevent a slip into the dark side? [00:24:53] DK: You know, I think people, and I bet your audience, Matt, is very familiar with this. When they think about the work lives or the communities they’re in, they’ll start to realize, “Yeah, you know, it’s that individual where’s that spark that brings out the good in others, that lifts people up, that brings in value to the group that gets power," and that’s part of what we talk about and my goodness, there’s no shortage of evidence of how we abuse power, right? From people in churches, to Anthony Weiner, regrettably named and on. It’s just everywhere. So what do we do? How do we avoid this trap? And I think the scientific evidence suggests a couple of things. One is just be aware of your power, and we often underestimate our power. We often fail to realize that once we’re in a position of management, other people will look at this differently. They’ll feel worried about their judgment of them. They’ll sense the power dynamic and we have to remember our sense of power in different contexts, right? When I work with my students, I make sure, in each interaction that I am mindful of the fact that they are probably a little worried about my authority and so forth and so I shift my behavior accordingly. I take a more modest approach, a more humble approach. I think the second thing, I think one of the most important things after just being aware of this state, and by the way, you’ve got to be aware of these urges of feeling powerful. Like everything is going really well, you feel invincible, that’s when you’re at your most vulnerable. A second thing that I think is really important is to really, in each interaction at work or at home, begin in focusing on other people. Really think about where they’re coming from, what’s on their mind, what’s their past been like and that really is the foundation of empathy and the pro-social tendencies like gratitude that really are a basis of enduring power. When I’m around people who really inspired others in leadership positions that quality really strikes me, right? That they’re really interested in other people. They’re curious, they remember what’s been happening in their personal lives, they know where they want to go in their future, in their work lives. So really make it a practice of just remembering where other people are at in your interactions. [00:27:25] MB: You’ve worked with some amazing companies, Google, Facebook, etcetera. How can some of these lessons potentially be applied to organizational dynamics? [00:27:35] DK: Being out here in Berkeley, you know, I’ve had this privilege in studying human emotion and it's kind of empowering. I have gotten calls from Google, and Twitter, and Facebook and worked at Facebook on these really complex projects for four and a half years on their protecting care team and over at Pixar and it really, this literature, when I teach this to leaders in different sectors, which I’ve done for 20 years, they know it right away, right? They know how Machiavellian leaders really bring units down and they know how the abuses of power, at Enron or in branches of governments or the military units, really undermine the functioning of teams and organizations. So it really begs this question of like, “What do we do?” And I think that one of the things that we do is we remind leaders that leadership has privileges and responsibilities and a set of ethics that really accompany it. And you see this interest in empathy and respect and cultivating trust and the like in it and thinking about leadership, right? So that’s one thing that is really important. It's just that there was an older school of thought that leadership, and in a way it’s Machiavellian, leadership doesn’t need ethics just get things done whatever it takes. And I think we’re moving slowly away from that way of thinking. I think the second thing that a lot of people are interested in is how do you create cultures or social systems that avoid the abuses of power, right? How do you create an organizational unit that doesn’t have a leader who’s pushing people around with this Machiavellian approach? I think that there are things we can do. I think you, and I hear about this a lot in my teaching of leaders, you can really work on a culture of respect really and make it very prominent that we really need to speak civilly, we can’t swear at people, we need to be considered in our language. What we know scientifically is when there is really clear scrutiny and oversight and accountability of people in positions of leadership where their actions are commented upon by their teams, where they’re reviewed, where others are aware of them, you see fewer abuses of power. So what I always emphasize is, let’s take the responsibility of ethical leadership if we are lucky to have that position, and let’s think hard about our culture in ways that prevent the abuses of power. [00:30:16] MB: For somebody listening, how could they work on cultivating some of this kind of social intelligence that underpins, not only sort of healthy societies, but also maybe the acquisition of good power? [00:30:29] DK: Yeah, and I know and I hope that I haven’t sounded too abstract or scientific or, you know? But, Matt, that is the real serious question in all of these and what I would recommend is, first of all, I just wrote this piece at the Harvard Business Review on how to have and enjoy enduring power, through the things that we’ve been talking about, Matt. Like, listening really effectively, asking great questions, knowing how to express gratitude in a heartfelt sort of thoughtful way, how to be aware of power and powerlessness, how to practice kindness in different places. So I think that article which did really well, just offers a series of practical things to do and I do that a bit in The Power Paradox, this book, as well and then the second thing that I really encourage your large audience to do is to go to the Greater Good Science Center, and that’s greatergood.berkeley.edu. We’ve been working away at this for 15 years, and what it is, is we distill all of these ideas that are all tested by science and we distill it down into really straightforward practices that you can engage in, right? So if you want to handle a really stressful boss better, there are mindfulness practices and breathing practices that help you calm your stress response. If you want to express gratitude in a really powerful literary way, at The Greater Good Science Center, all for free, we write about how to say thank you. If you are in a really difficult conflict and it could undermine your power and your influence and the quality of your bonds, we have a lot of tools for showing forgiveness and saying you’re sorry. So, at that site, there are tons of practical recommendations that are really the foundation of this new model of collaborative and enduring power. They're all free! [00:32:27] MB: Oh, perfect. Well, we'll make sure to include both of those in the show notes so that anybody listening can get those. Tell us a little bit more, you kind of touched on it, what is the Greater Good Science Center, and what led you to create that? [00:32:39] DK: Yeah, thanks Matt. 15 years ago, and this was right in the wake of the terrorist attacks, 9/11, in a sense as we are today, we were jangled as a culture back then and we were like, "What's the world coming to? Who are we? How do we respond to this new world of threat, and so forth? Are we heading towards the apocalypse?" Some donors, the Hornadays, who are are alumni of UC Berkeley, coming out of their own personal tragedy of losing a daughter early in life at age 26, reached out to me and they said, "You know, we want to build something that makes as many people cooperative, kind, and peaceful as humanly possible." This was really before online magazines and podcasts and the like, and what we decided to do — and we hired somebody named Jason March coming out of a journalism school — is we decided to take this new science we've been talking about of cooperation, collaboration, and gratitude, and compassion, and empathy and the like, and translate that science to essays that people can read — like medical doctors, or lawyers, or school teachers — more recently, with Greater Good In Action, sort of give people practices. You know, "What can I do in a couple of minutes that makes me more empathetic?" And those are listed at ggia.berkeley.edu. Then over the past 15 years, we've been lucky to be able to give that away. To give away this new science, give away it's major discoveries, write about it in really appealing ways, that appeal to our 5 million readers. And now, sort of now that science is starting to test these practices, to sort of give away specific recommendations for cultivating gratitude, or empathy, or kindness. And that's our mission, and it's had a lot of influence in the educational realm, and medical realm, organizational work, and we hope it continues to grow. [00:34:41] MB: Well I think it's a credible mission, and a great resource. So, I'm very excited for listeners to check it out. [00:34:47] DK: So am I. Thank you. [00:34:49] MB: Changing gears a little bit, I'd love to hear about your experience consulting on the film Inside Out. [00:34:54] DK: It was mind blowing. So about six years ago, I had known the director Pete Docter who did the movie UP. Did you get to see UP? [00:35:05] MB: I have not seen UP actually. [00:35:07] DK: You have to see it. It's got one of the best portrayals of love that you'll ever see. So I have known Pete professionally, we'd been on some panels together 8-10 years ago. Pixar is over in Emeryville, which is next door neighbors to Berkeley, and one day he called me six years ago and he said, "Hey, you know, hey Dacher, this is Pete." And I was like, "Hey Pete," you know? And he's like, "Thinking about doing a movie about human emotion." And I was like, "Well, that's a great idea," and I'd been teaching emotion for 20 years. And he said, "And what I want to portray is how emotions," and we talked about this earlier, "they guide our thought processes and our memories and how we perceive the world in front of us. And then at the same time, as they shape inside our heads, emotions — through our expressions, and our tone of voice, and our body language — shape the outside world, how we interact with others — the inside-out notion." And I was like, "Pete, that's the entire thesis of the science of emotion, is they guide interior life and exterior life." And he said, "And I want to do it in an 11-year-old girl as she's going through a really hard time in life." And I was like, "Oh my god," you know? So what happened is about every six months or a year from the beginning of the development of this film where Pete was just working with his collaborator, Ronnie del Carmen, kind of sketching out the characters and the ideas until the very end when they're really working with their teams of animators and computer specialists and the like. I'd pop in, and I'd talk about the science of emotion, sometimes they'd ask me questions like, "Tell us about what happens to emotions when they stop? Like, where do they go?" Or, "What happens to emotional memories? Why do we forget so many emotional parts of our lives?" Or, "Are there things that happen to us early in life, core memories with friends or with our parents or maybe getting bullied at school, or what have you, that shape our mind for the rest of life?" So I would visit, just talk about science, answer questions over email, and then about six months before the film was released, they brought me in to see a screening and I literally started crying. I mean, I was blown away at how much depth that film captured in portraying the science and then what emotions do for the human psyche. [00:37:39] MB: It's an incredibly power film and one that many, many people, it resonates really deeply with them. [00:37:47] MB: And the science behind it is very, you know, totally valid and was kind of what you consulted on and helped really bring to life. [00:37:55] DK: Yeah, you know, so they would ask me questions like, "Do early emotional experiences, like in Riley's character, these early images, the core memories with her friend or playing hockey or ice skating with her family, do they shape what our lives are like later? And yes they do. The scientific literature suggests it's the case. Here's a really relevant scientific literature; they asked me, "You know, we've got this idea," — and Pete had a daughter that really inspired the movie. I had daughters that were making me wonder about what they were going to sort of portray in the movie at the same age — "What happens do young girls as they head into the teen years, as Riley is in the movie? What happens to their emotional lives?" And I went to the scientific literature and I don't know if you have kids or not yet, Matt? But when girls hit 12-13, a 10-year-old girl is a really happy person, thriving, and joyful. And then as they hit the teen years, they, kind of that worry and anxiety and self-consciousness hits and they really drop in their positive emotions precipitously and the film really portrayed that, right? The emotional angst of the early teen years. They asked questions like, "Are people defined by core emotional tendencies or traits?" Right? And we had done studies and we'd looked at like, who are the really compassionate people, or the awe-prone people? I've done work on really angry kids, or fearful kids and there is a lot of data that suggest that who we are in our identities and how we think of ourselves is shaped by our temperamental tendencies towards specific emotions and that led to the thinking in the film of Joy being this defining emotion of Riley. I was blown away how seriously they took the science. In one moment, Pete Docter, he was in Russia promoting the film and he was going to have a conversation with a Russian neuroscientist with this giant audience in Russia. And he emailed me at 1 in the morning and he was like, "Tell me everything you know about dopamine and oxytocin and serotonin and cortisol," these neurochemicals that are involved in emotion. So I sent him chapters from my textbook and scientific papers. So they really were grounded in the science, but then they took their liberties too. [00:40:16] MB: So for someone that, let's say is sort of predominantly defined by an emotion like fear or anxiety, is that something that is kind of their destiny? Or is that something that's changeable? [00:40:28] DK: That is not only one of the oldest questions that we ask about human nature, which is we are born with certain genetically-based tendencies, so how do we shift them? That not only relates to amazing new literatures called epigenetics, which is, we have these genetically-based tendencies but experience, your life with your family — were you born in a civil war? Are you born in an area of poverty where you don't get parks and opportunities to play — actually shapes the expression of genes. That question is also personally relevant, which is, you know, I have a lot of anxious tendencies in my mom's side and have had a lot of periods in my life where people would say I have anxiety tendencies, and that is part of who we are. I think the evidence from genetic studies and identical twins and studies of rodents where you alter their genetic structure tells us it's probably 40% of who we are. But a big part of who we are, Matt, is what we do with it, right? One of my motivations with the Greater Good Science Center is having experienced firsthand how volunteering — I work in the prisons and volunteer — kind of makes me feel stronger than my anxious tendencies. And I've learned firsthand that if I practice a little mindful breathing each day, I'm physically calmer. And I've learned firsthand if I go backpacking or get out in nature, I feel stronger. And so what we promote at the Greater Good Science Center is a practical answer to your question, which is, you may be born with an anxious genetic profile, but there is an enormous amount to do that brings you peace, and contentment, and wisdom in the face of that tendency and the data back it up. [00:42:21] MB: So this is kind of a non sequitur question, but one of the pieces of research you've done that I found fascinating was about how we can communicate emotions just with touch. I'd love to kind of share some of that research and tell that story really briefly. [00:42:38] DK: Thank you, thanks for asking that because the scientific literature has kind of looked at this research like, "Wow, that's weird." So I've studied human emotion for 25 years since I worked with Paul Ekman, and it got me to Inside Out. I studied the face, and voice, and body, and gesture, and eye contact, and the like. And one of the things that scientists had not studied is touch, right? How we, you know, when you pat somebody on the back or you give them a hug or your fist-bump, or chest-bump, or what have you, what can we communicate with brief patterns of touch? We know touch is massively important in human social life. It's really the first bond, or the first medium by which babies connect to their parents, right? Is through touch and voice. And we know big parts of your brain process information about touch. So what we did in our first study with Matt Hertenstein at UC Berkeley is we brought people to the lab, one person comes to the lab, we hand them a list of emotions written on a piece of paper; gratitude, anger, compassion, love, sadness, sympathy. And then another person arrives, and they stick their arm through this big barrier that we built in the lab, and that first person now has to touch that arm for half a second to communicate all these different emotions, right? If I'm the second person, I get touched on the arm and I have to guess what emotion that person was trying to communicate. And what we find absolutely astounded me, which is where as chance guessing would be anywhere between 8 and 12% depending on the study, people can communicate compassion, gratitude, love, sympathy, anger, disgust, fear, sadness at seven or eight times the level of chance guessing, 60-70% of the time they get it right. So what that tells us, Matt, is we have this amazing language of touch by which we can say we're sorry to somebody, we can express thanks, we can express affection, we can show frustration just with these very brief incidental patterns of touch. [00:44:50] MB: And one of my favorite findings from that was some of the gender differences in the research. [00:44:56] DK: Oh no. I was hoping you wouldn't ask me about that. Yeah, you know, my student, Matt, came to me and he's like, "You know, Dach, we've got this great paper taking shape, but I need to tell you about these gender differences." I was like, "What?" He's like, "Well, when the woman tries to communicate anger to the male arm, he has no idea what she's doing." I was like, "Ah! That's terrible," you know? "And secondly, when the man tries to communicate compassion to the female, she can't really tell what he's doing. She gets very few right." And we replicated that, and I think this was just a classic heterosexual gender story, which is men have a little bit of trouble conveying sympathy, and women struggle a bit more in showing anger that a male can perceive. So it's a very telling set of findings that speaks volumes to our intimate lives. [00:45:50] MB: So what is one piece of homework that you would give somebody listening to this episode? [00:45:55] DK: So first, I'd go to the Greater Good Science Center and if your listeners, Matt, are interested in this stuff, they're interested in the science of Inside Out or good power, or how do you handle stress? Or how do you cultivate gratitude or awe? Just go there and we have built it up over 15 years in a way that is tailored to each individual and what they're really interested in building. I think the thing that doing the science and writing these books and just teaching this stuff for 25 years has really taught me, and in a way it goes back to what you said, which is, "Let's move out of this cynical view of human beings, survival of the fittest, and let's look at people in the new light." And it's really hard today, in this political climate for example. But I think the piece of homework that I feel this work points to is for your listeners to really study people carefully and take delight in how good people can be and then figure out ways to make societies do a better job of cultivating those tendencies and bringing those things into your life more. And, you know, these are old ideas you find in the great ethical traditions and if we return to them today, you'll do okay. [00:47:10] MB: And you touched on this already, but where can people find you online, one more time? [00:47:14] DK: There are several things to do to find me online; greatergood.berkeley.edu, ggia.berkeley.edu. You can Google the Berkeley Social Interaction Lab for our scientific papers, and then if you really want to dig deep, you can take edX's free class, The Science of Happiness. So if you Google "edX, Science of Happiness", we've had over 400,000 people enrol for the class, and it covers a lot of what we're talking about today. [00:47:44] MB: Well, we'll include all of those links in the show notes as well for everybody listening, so you'll be able to access all these amazing resources. Well Dacher, thank you so much for being on the Science of Success. This has been a fascinating conversation. I've learned a tremendous amount and I know that listeners are really going to get a lot out of this. [00:48:00] DK: Thank you so much, Matt. I really appreciated your questions. [00:48:03] MB: Thank you so much for listening to the Science of Success. Listeners like you are why we do this podcast. The emails and stories we receive from listeners around the globe bring us joy and fuel our mission to unleash human potential. I love hearing from listeners. If you want to reach out, share your story, or just say "hi", shoot me an email. My email is matt@scienceofsuccess.co. I would love to hear from you, and I read and respond to every single listener email. The greatest compliment you can give us is a referral to a friend, either live or online. If you enjoyed this episode, please, leave us an awesome review and subscribe on iTunes. That helps more and more people discover the Science of Success. I get a ton of listeners asking me, “Matt, how do you organize and remember all this information?" Because of that, we created an amazing free guide for all of our listeners. You can get it by texting the word “smarter” to the number 44222, or by going to scienceofsuccess.co and joining our email list. If you want to get all the incredible information, links, transcripts, everything we just talked about and much more, you can get all of our show notes at scienceofsuccess.co. Just go to scienceofsuccess.co and hit the "show notes" button at the top. You will get the show notes for everything; links, articles, all the important stuff that we talked about, and episode transcripts.